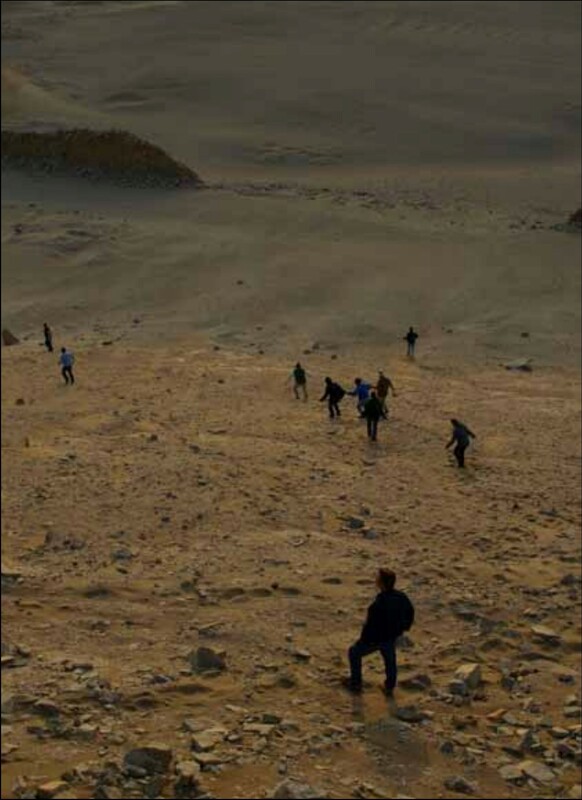 To the south of Casma city in middle of the desert stand unfathomable stone structures more than 2,300 years old that comprise a ceremonial center, which include a majestic fortress and 13 towers that form horizontal “tooth-like” formations that mark positions of the sun. Recent investigations demonstrate that these erections keep the exact relationship of the movement of the sun throughout the length of the year, which proves that they functioned as a solar calendar for the ancient inhabitants of the region. 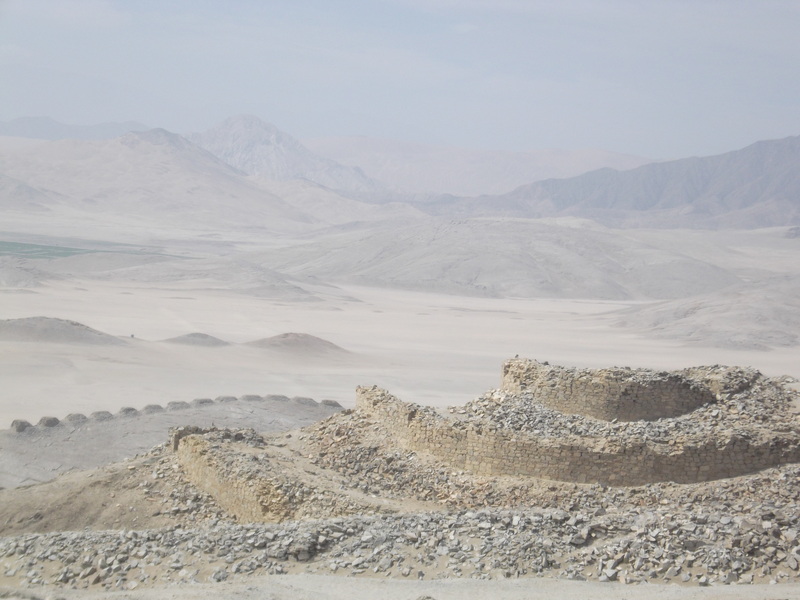 This discovery puts Chankillo on the small and reduced list of the most ancient observatories in the world. The study of historical evidence of the chronicles and other colonial documents, along with the analysis of the spatial disposition of sacred architecture of Cusco, especially the system of imaginary lines or ceques, has permitted the reconstruction of diverse time control tactics throughout the landscape of the Incas (Zuidema, 1995; Aveni, 1997; Bauer & Dearborn, 1998). The so-called “Pillars of the Sun” have received great attention. They were described by various journalists as large stone pillars located on the horizon, visible from the main square of Cusco. Unfortunately, they disappeared without a trace, therefore leaving no consensus of their specific function. Apparently they were used to signal times for planting, harvesting, and regulating other seasonal practices. The Inca Pillars of the Sun are an example of “horizon astronomy,” the typical practice of traditional societies that recorded the movement of celestial bodies with relationship to its intersection with the horizon (Ruggles 2005a). The calendars of the solar horizon were of great importance among the indigenous villages of America. Some were not based on the sun, such as the traditional moon-star calendar of the Boran ethnic group of Ethiopia and Kenya (Bassi 1988). Horizon astrology parts from very simple beginnings. For example, if every morning the sunrise is observed from a fixed point on the horizon with distinctive elements such as peaks and valleys, it will be seen that the starting position will move daily along the horizon throughout the course of a year. 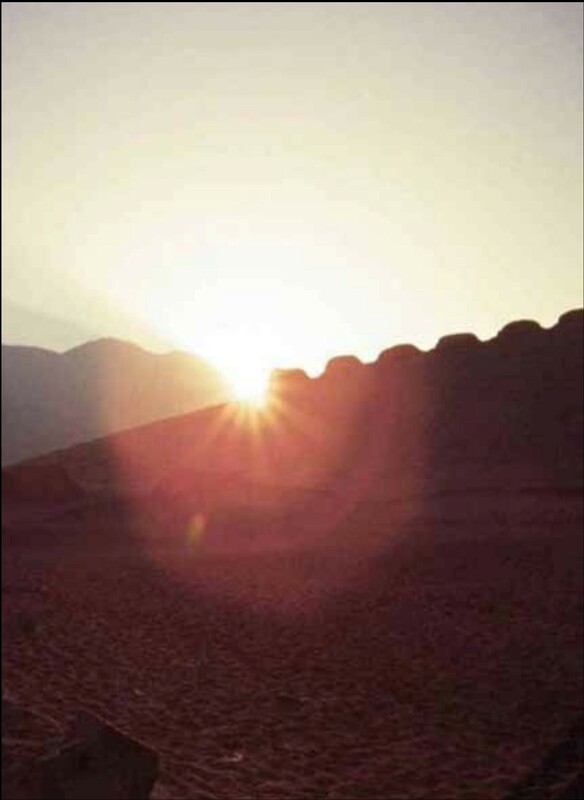 Therefore, it is noted that the sun comes up on a determined date, or if this point is marked by the human construction of the Pillars of the Sun in Cusco, the cyclical nature of the sun will make this alignment repeat itself in the same place and time each year, allowing for its use as a calendar. 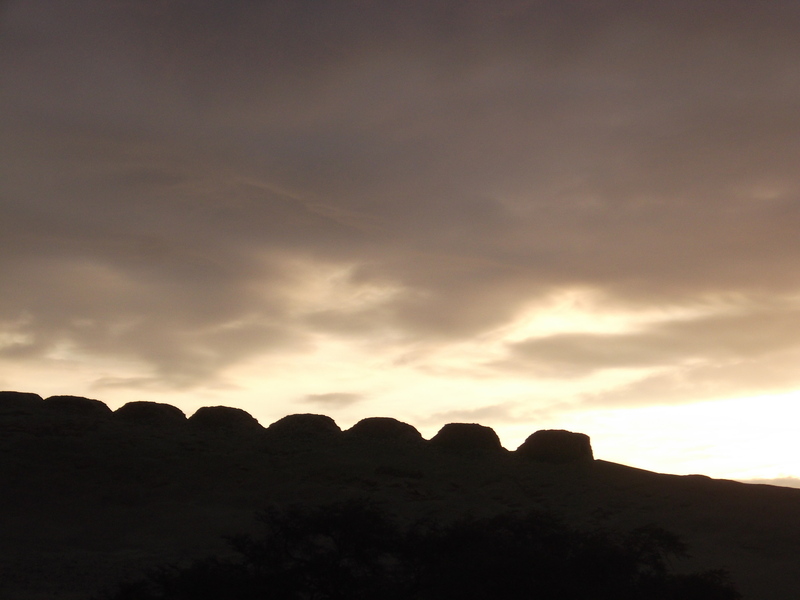 It has been postulated that the Thirteen Towers, a row of thirteen buildings on top of a hill in Chankillo, Casma were able to function similarly to the Inca Pillars of the Sun, marking the horizon and aligning with the sun on certain dates when seen from a fixed point (Ghezzi and Ruggles 2007). It is amply recognized in archeoastronomy that, with the absence of historical records, it is dangerous to make observations based on clues. Therefore, established way of checking these explanations exist. It is necessary to find a fixed point of observation and a marker on the horizon. Preferably, these should be an unmistaken result of human work, such as platforms, entries, stone pillars, etc., and the alignment of these things should point towards a study of an astrological event that is culturally significant. 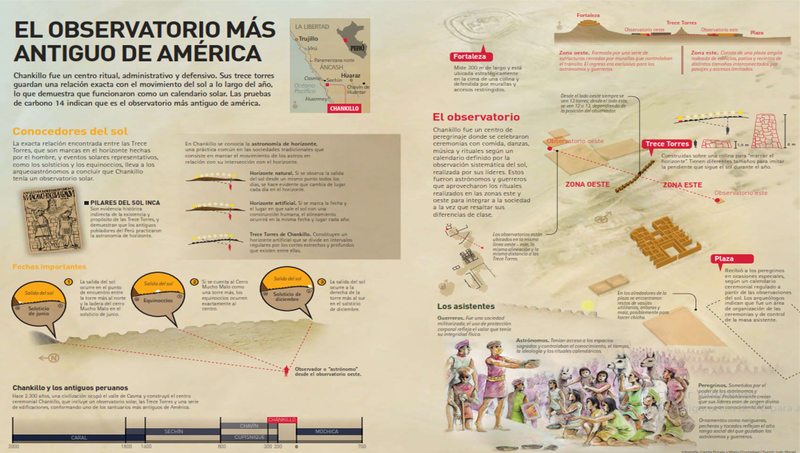 Then, a brief description of the Chankillo archeological site and the pertaining elements (such as the points of observation and markers) that have permitted the interpretation of its famous solar observatory are presented (Ghezzi 2006, 2007; Ghezzi & Ruggles 2007; Ghezzi 2008; Ghezzi and Ruggles 2008a, 2008b). Chankillo is an architectural complex deliberated with monumental character that has simultaneous attributes of being a ritualistic, administrative, and defensive center. It is found in the lower valley of the Sechín river basin, Casma, in the region of Ancash, and it was occupied between the approximate years of 400 and 100 B.C. It is the most prominent example of the new class of monumental site that made its appearance in the cultural landscape of the northeastern coast, particularly between the Virú Valley and Huarmey Valley, probably after the abandonment of the Chavín de Huántar Temple. These settlements were usually located among hilltops – the most appropriate place for prevention and defense against the enemy – and constitute the greatest magnitude of public architecture of its period, which is not found in the Aldeans, nor in the architecture of the elite residence (Willey 1953; Bonavia 1982; Proulx 1985; Daggett 1987; Wilson 1988, 1995; Przadka and Giersz 2003). Map of Chankillo where are observed: (A) thirteen towers; (B) west observatory; (C) the observatory; (D) administrative center; (E) Square; (F) Fortaleza. UTM coordinates expressed in the system, 17l zone, datum World Geodetic System 1984. Since the writings of Collier, and rightly so, the probable relationship has been emphasized between the construction of fortified settlements and the increasing proliferation of weapons found in funeral belongings and images of warriors has been emphasized (Collier 1955, 1962; Makowski 2002; Ghezzi 2006, 2007). Therefore, the study provides valuable information about how that power is exercised in a key period of Andean prehistory that elapsed between the rise of the great ceremonial centers from the period of the origin of civilization, of the Formative, and the information of the expansive states during the period of the Regional Developments. 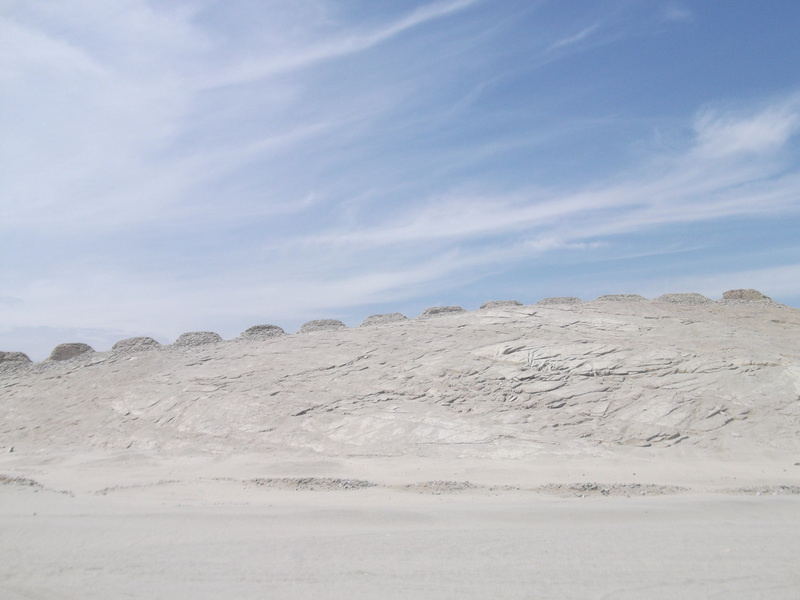 Chankillo showcases several monumental collections of stone and clay mortar, including the Fortaleza and the Thirteen Towers, both of which are located on the summit of the rocky hills, separated by open pieces of sandy land in which spacious enclosures are found. 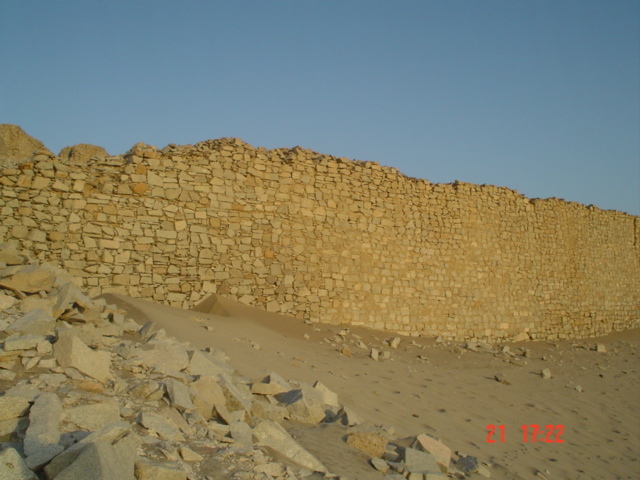 The most well-known sector of this site is called Fortaleza, an impotent structure 300 meters in length that is strategically located on top of a hill and strongly defended by walls and restricted access. This building has been interpreted as a fortress, a citadel, or even a ceremonial center (Topic and Topic 1997). However, recent archeological investigations offer an alternative explanation of this building as a fortified temple (Ghezzi 2006, 2007, 2008). The area located to the east of the Fortaleza has several building, markets, and courtyards. The Thirteen Towers constitutes the most significant element of this sector, which consists of a row of thirteen erected cubic structures that are found on a low hill at the approximate center of the site. The row of towers has a north-south orientation, but if counted from the northern-most tower, tower 11 to 13 shows a shift to the southwest. Each tower has a pair of built-in stairs that lead to the top. When seen from the lower part, the towers form an artificial “tooth-like” horizon. In addition to the Thirteen Towers, Chankillo possesses at least two observation points. A group of structures surrounded by perimeter walls that perhaps served to control traffic is located at the foot of the towers on the west side. A building composed of two adjacent rectangular courtyards stands out. The bigger courtyard, on the southeastern side, was built very carefully, plastered, and painted white. Attached to the southern wall of this building is a very particular structure: a corridor of almost forty meters long also plastered and painted white. Oddly, this corridor does not lead to the interior of the building, but instead is an outlet portal oriented directly towards the rows of towers located 235 meters away. First of all, there are several indications that in the design of Chankillo one can see reflected a society with a certain grade of division. If the north-south line of towers is taken as a division line, there is an obvious contrast between the eastern side, with abundant evidence of public activities a large size in open spaces, and the western side, where existed strict control over the access to the fortified temple and observatory, and the ritualistic practices that were carried out on the insides of these buildings. Considering this and its southeastern orientation, only from the exit threshold could the artificial horizon form of the towers be appreciated without obstruction. It would have sufficed to be only a couple of meters behind the output threshold in order to lose oneself in this magnificent site. Finally, the excavations from this point revealed several offerings. It follows, therefore, that the function of the corridor was to regulate a ritual that consisted of passing through this to get to the threshold to deposit offerings and see the artificial horizon formed by the Thirteen Towers. The thirteen towers, the arrangement of the towers Chankillo views from the fortress. On the eastern side of the foot of the hill where the towers are found, there is a voluminous open space surrounded by a large architectural complex and smaller building. The elaborate design of the architectural complex is notable: a platform over the square where courtyards and enclosures of different sizes were built, interconnected with passages and restricted accesses. A small staircase is the only access to this complex. A large courtyard surrounded by a U-shaped platform stands out, with pairs of stairs that direct traffic to differing environments. The plaza is a large open space in front of this building. The Fortaleza and the Thirteen Towers, because of their elevated position and monumental scale, stand out as the most dominating elements of visible landscape from the plaza. Due to its structure and remnants on its surface, this sector is interpreted as a public area with a combination of functions relative to the administration and redistribution, as well as ritual practices. The Thirteen Towers can be seen with the naked eye from many points on the plaza. However, a particularly small and relatively isolated building located at one end of the square is of great interest. Its location is symmetrical to the eastern observation point: both find themselves on almost the exact same east-west line, have the same elevation, and are almost the exact same distance from the towers. From this small, poorly maintained building, the portion of the visible horizon occupied by the thirteen Towers forms an artificial horizon, and its position and orientation infer that it also contains an observation point. To verify that the Chankillo observation points permitted the use of the towers as markers of the horizon to determine dates, an archeoastronomic study was done on the situal alignments (Ghezzi and Ruggles 2007, 2008). Even at a glance, Chankillo immediately shows astronomical attributes: its orientation coincides with sunrise on the horizon on the December solstice, or sunset on the June solstice. Once precise measurements of the Chankillo alignments are performed using archeoastronomic methods, an extraordinary result is revealed: when the Thirteen Towers are appreciated from any of the observation points, its extension on the horizon corresponds very accurately to the range of positions of the sunrise and sunset throughout the year. This fact itself convincingly indicates that the Thirteen Towers acted as markers of the horizon. For example, as seen from the western observation point, the sunrise occurs just to the right of the southern-most tower on the December solstice. During the June solstice, the sun comes out just at the meeting point between the northern-most tower and the slopes of Cierra Mucho Malo, a natural formation three kilometers of distance, which forms a gap similar to those between each pair of towers. This special configuration suggests that this natural hill could have been symbolically perceived as an additional tower. At a time so associated with festivals of harvest propitiation, it was probably a very significant event for this society that the sun emerged bordered by a natural hill and a human structure. On the other hand, seen from the western observation point, the equinoctial sunrise occurs exactly at the gap between towers 6 and 7. If we considered Cerro Mucho Malo as an additional tower, taking its demonstrated participation in the solar alignments of Chankillo into consideration, then the equinox that occurs at the center of the row of towers and its symmetry becomes very evident. The same extraordinary alignments of the solstice and equinox are esteemed from the eastern observation point during sunset. Another important result is that, when the sun begins to distance itself from its extreme northern and southern positions, it moves only east within the range of the horizon demarcated by the towers. Thus, apart from the towers that are aligned from the solstices, the remaining towers and gaps between them would have provided the means to continuously track the sun’s path along this artificial horizon with an accuracy of 2-3 days. Astronomical Accuracy: Photograph of sunrise on the June solstice, between the hill and much bad Tower 1, seen from the observation point west. Archeoastronomy is the study of the past beliefs and relative practices relating to celestial bodies, especially in the prehistory. Its study not only allows for the multiple ways in which human societies understood what they saw in the skies to be revered, but it also permitted the acknowledgement of how they used this knowledge for cultural, social, and political purposes. One of the greatest examples may be that of the elite Incas, whose right to rule flowed from its relationship with the sun. If the principle purpose of the Thirteen Towers was to serve as a marker on the horizon to observe the rising and falling of the sun, then what was the relationship between this observatory and the societal calendar that Chankillo constructed? We understand from the calendar a measurement of cultural convention and subdivision of time in units of fixed duration. A calendar is generally based on calculations of time, from the observations of periodic astronomical cycles. The regularity between these spaces suggests that the calendar was divided into equal intervals. The sunrises in the spaces between the towers 3 and 11 were separated by periods of about 10 days, which implies that the solar year could have been divided in regular intervals. However, these time intervals are longer between the end towers: 1 and 2 and 12 and 13, because when the sun reaches this position near the solstice, it moves more slowly with respect to the horizon. Any astronomical interpretations may sometimes fit too easily – but simplistically – into preexisting alignments. In comparison to the many problematic cases of the Andes and around the world, the solar alignments of Chankillo are indeed presented in a notably clear and convincing way. First, the towers are documented analogues of the Sun Pillars among the Incas, for whom we have indirect historical evidence of purpose and existence. Second, in this interpretation, astronomical astronomic objectives are not being arbitrarily selected from innumerable possibilities, as was intended for a long time with the lines of Nasca, but have direct indications of exit points and positions of solstice and equinox. These are astronomical objectives whose importance for many worldviews, including the Andeans, is amply confirmed (Ruggles 2005a). Third, other alignments indicated by the towers allow the subdivision of at least a part of the year into regular periods. Therefore, the Thirteen Towers may be interpreted with as much certainty as an empirical calendric mechanism, and they belong to an exclusive list of ancient world observatories. It may have been possible, as in the case of Chankillo, that a society of astronomers and warriors recognized the direct observation of the annual solar movement across the artificial horizon with the purpose of holding regular seasonal events, such as religious festivals or the maintenance of a calendar. To evaluate the nature of these observations with the social and ritualistic contexts from which they developed is not a simple homework. A good starting point is to note that these astronomical observations can be carried out using observation points and markers much simpler than those present on the Chankillo horizon. Examples of the practice of horizon astronomy that use natural distinctive elements, such as peaks, slopes, and rocks, are abundant among traditional societies (Ruggles 2005a). 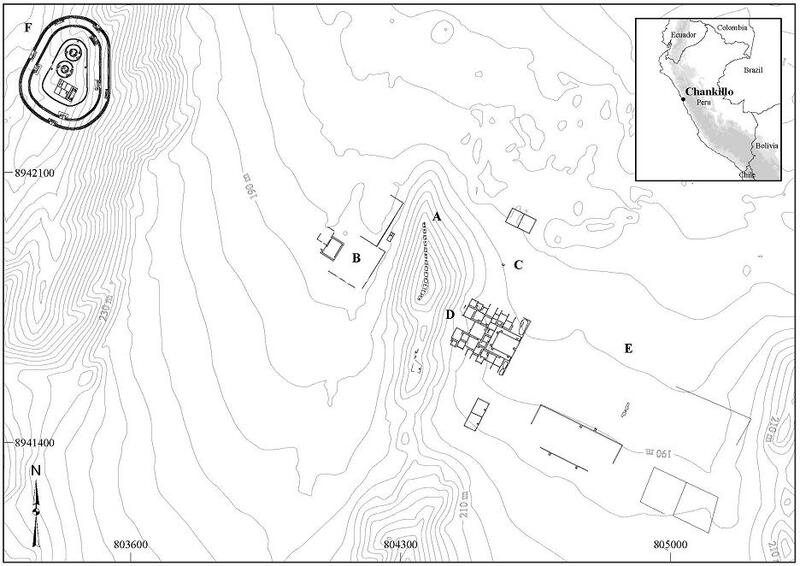 On the contrary, the observation points and horizon markers of Chankillo are formally defined by ad hoc constructions. In the case of the markers, they are made on a monumental scale, of high visibility, and occupy the central place that was most likely used as the most important ceremonial site of this society. The extent to which the design and location of the Thirteen Towers exceeds the requirements by which to fulfill its function raises doubts strictly from a technical point of view that its purpose was only for practical uses such as regulating agriculture, fishing, and carrying out other seasonal activities. It is evident by its design and construction that other principles were involved, such as ideological social, ritualistic, and political motivations. In the Mayan world, for example, recognition and prediction of celestial cycles were far beyond the obvious need to regulate annual cycles of activity according to seasonal changes in nature and had purposes of divination and prognosis (Aveni 1992). What was, in fact, the social and ritualistic context in which the astronomical observations in Chankillo were observed? To explore this aspect it is necessary to situate the evidential alignments in their archeological contexts (Ghezzi 2006, 2007; Ghezzi and Ruggles 2007; Ghezzi 2008; Ghezzi and Ruggles 2008a, 2008b). In the first place, there are various indications through the design of Chankillo that a society with certain grades of differentiation is reflected. If you take the north-south line of towers as a dividing line, there is an obvious contrast between the east side, which has abundant evidence of public activities on a large scare in open spaces, and the west side, where existed strict control over access to the fortified temple and observatory, and the ritualistic practices that were carried out inside of these buildings. While the plaza had received large groups of peasants on special occasions, access to the most profound significant ceremonial places, like the astronomic observation points and the Temple of Pillars inside the Fortaleza, was a privilege enjoyed by few. Therefore, it is evident that the design of Chankillo suggests a relatively differentiated social organization (Ghezzi and Ruggles, 2008). From this perspective, it is important to take into account evidence of banquet rituals in Chankillo. In various places in the great plaza that are to the east of the towers, offerings of ceramic instruments and shells of spondylus mollusks (concha mullu) are found. In surrounding areas trash sites were found that contained remains of useful pottery, ceramic instruments, and corn. Also, treatment facilities for the preparation and storage of drinks were detected – most likely “chicha” judging by the abundant remains of corn. Therefore, in the plaza they would have celebrated ceremonies where they consumed food and drinks, accompanied by music, dance, and other ritualistic practices. These festivities would be organized on a ritual calendar defined by the systemic observation of the seasonal passing of the sun. Some notable astronomic events, the ones visible from not only observation points but also visible from the plaza, for example the setting of the sun on the December solstice as it falls over the Fortaleza, probably may have been the central dates of this ceremonial calendar. During these festivities, a large number of peasants reunited in the plaza to participate in the ceremonies. The huge architectural complex to the east of the towers would have been the organizational center, of these ceremonies and the control of the participating masses, according to its design that suggests administration, redistribution, storage, restriction to access and social differentiation. The redistribution of food and other items, in a ritualistic context, to create bonds of mutual reciprocity, to promise funds or labor for projects, establish alliances, to be exchange partners, etc., is one of the universal strategies practiced by societal leaders to obtain economic and political advantages that consolidate the inequalities of social status and wealth on which its power is based (Hayden 2001; Bray 2003). Therefore, the individuals with access to sacred spaces and in control over astronomic knowledge would have been the drivers and great benefactors of the public banquets orchestrated by the movement of the Sun. These leaders would have possessed the capacity to have a special relationship with the sun, just like the Incas did almost two millenniums later. In this context, the images of warriors of Chankillo can be considered support for these ideas. 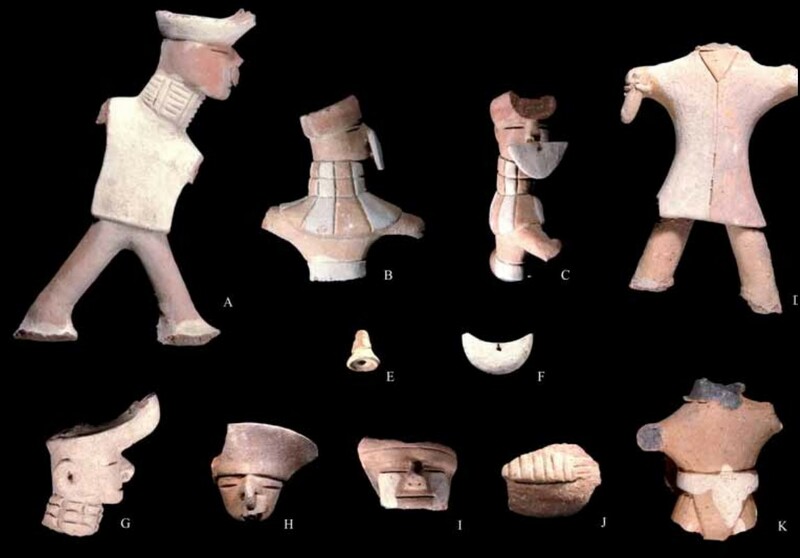 The excavations of the western observatories recuperated a collection of ceramic figures that represent pairs of warriors in dual. They carry special weapons, mainly throwers and darts, but also batons and spears; in other words, it was an appropriate kit for the attack and defense of a fortification, in addition to the importance of hand to hand combat and the prestige it confers. The warlike repertoire also includes shields and other forms of body protection, which indicated the physical integrity of the characters during battles. In addition to the militia and social prestige that deliberated battle skill, the warriors also used ornaments that symbolized their elevated social status, such as the elaborated variety of headdresses, shirts, capes, and ornaments, probably made of metal in the nose, neck, and torso. The symbols of elevated status, such as the evident concern about the physical integrity of the person during combat, suggest upward mobility of a class of warriors. Among the Incas, chronicles reveal details of ritualistic practices and chronological beliefs relative to a worship of the sun that was regulated by the state. A marked interest is in the movement of celestial bodies and the calendar existed, and it has been suggested that the worship rituals to the sun were orchestrated by the governing bodies to sustain its divine origin, centralize its power, and legitimize its authority (Ziólkowski & Sadowski 1989; Baur & Dearborn 1998). All of the time there is more archeological evidence that this solar cult, official ritual of the Inca state, had precursors. For example, the sunrise ceremonies that were historically registered in a sanctuary of the Isla del Sol (Island of the Sun) on Lake Titicaca had Pre-Inca races (Dearborn et al. 1998; Baur and Stanish 2003). Given the similarity between the solar observatory of Chankillo and the pillar documents in Cusco almost two millenniums later, it is probable that those practices were relatively common among the societies that unfolded in the Andes. Even more, if a comparison is allowed, it is reasonable to propose that the social and ritualistic context in which the astronomic observations and sun worship of Chankillo operated in century IV B.C. were relatively similar to imperial Cusco. Therefore, the remedial role of sun worship and its related cosmological beliefs, the management of the ceremonial banquets, the redistribution of goods and excellence in combat, both real and ritual, would have been the attributes that gave legitimacy and authority to an elite group of warrior astronomer leaders in Chankillo, just like what occurred among the Incas almost two millenniums later. The observatory and its 13 Towers were not only the monumental expression of a very ancient astronomic knowledge, or an instrument to observe the sun, but they also would have served to regulate the ceremonial calendar and give support to the established. Archeoastronomy is the study of the beliefs and relative practices relating to the sky in the past, especially in prehistory (Aveni 2001; Ruggles 2005b). It is not only the study of “alignments,” as its origins and a large portion of its participants may suggest. On the contrary, it blankets under the same roof of very diverse branches of knowledge, such as astronomy, archeology, ethnohistory, and ethnography, through what is a deeply interdisciplinary field of study called cultural astronomy (Aveni 2008). It is not doubtable that astronomy was fundamental for many past societies (Ruggles 2005a). A common aspect of these societies was a life governed by the observation of the objects and events of the world that surrounded them, including the firmament. Therefore, many societies perceived a close connection between cyclic movement of celestial objects and events that transpired on the earth. Often, the application of these two connections had practical applications, such as when the stars were employed for guidance and navigation, or when seasonal markers were registered to control and maintain a provision of nourishment year round. The calendars, for example, even the most rudimentary of them, were always necessary for the survival in all kinds of society, from the smallest groups to the most complex urban societies. But beyond the mundane requirements following the most basic astronomical practices, another common feature in ancient societies was the need to understand the world they inhabited (Ghezzi and Ruggles 2008). In these cases, the perceived connection between heaven and earth only made sense as part of a particular way of seeing the world, as within a worldview. Therefore, in general, the location, design, and orientation of tombs, houses, ceremonial centers, including cities, may be a reflection of the key cosmologic principles of a society. Precisely, the studies of the past that have been spread in the last decades proliferate approaches, among many things, the understanding of how prehistoric societies perceived, conceived, and ordered the world they inhabited (Hodder 1986). This world includes, of course, its heavens. If this approach is taken, there are compelling reasons to focus on the study of the celestial bodies (Renfrew & Zubrow 1994, Ruggles 2005a). In the first place, one should consider that many societies perceived the heavens as a whole that integrated an individual and his/her community. The human body, its dwelling, or temple was seen as a microcosm that reflected and reinforced the nature and structure of the great cosmos. The heaven was always an integral and prominent part of this cosmic space. Its regular cycles were part of the same essence of life, and its rhythms were correlated with the hour of the day and seasons. Therefore, the study of the heavens offers to us a direct window to an essential aspect of the worldview of societies of the past (Ruggles 2005b). Secondly, traditionally the study of prehistoric landscaping has been vital for the reconstruction of a society’s way of living. However, this constantly changes with time, sometimes gradually and sometimes abruptly: the locations of the settlements and use of the soil are altered, the people move from one place to another, plants and animals adapt or go extinct, etc. Therefore, we can only aspire for an indirect or incomplete knowledge of the landscape of the past. For example, the orientation of a tomb toward a particular element of the environment, like an archeological site, may not be evident if that element is not visible today, due to destruction by human or natural causes. Different from the study of the landscape of the earth, the study of the heavens permit us to deconstruct the position of the sun, the moon, and the stars, seen from whichever part of the globe, in whichever moment in the past. Even more: we can visualize this reconstruction directly in a planetarium or on a computer screen. Then, following the example mentioned above, when the orientation of a tomb is directed toward an object in the skies, by applying the methods of modern archeoastronomy, we could potentially identify this relationship – no matter the length of time that elapsed. Finally, the study of native astronomy allows the appreciation of not only the multiple forms by which human societies understood what they were seeing in the sky, but also how they used this knowledge for cultural, social, and political purposed. One of the best examples of this may not be the elite Inca, whose right to govern flowed from its kinship with the sun. There are numerous examples of buildings whose design reflects the worldview that prevailed in the society that built them (Ruggles 2005a). When this design includes relationships with the sky for example, the orientation to the position of a celestial object, then archeoastronomy can recognize this relationship and reveal important aspects of the worldview that generated it. For all these reasons, it is not surprising that archeoastronomy becomes increasingly more important in the study of humanity’s past. However, despite its important, it should be recognized that common errors in the methodology and interpretation persist in the practice, making it difficult to develop as a discipline. Ancient civilizations sought to understand the world that surrounded them and understand the vital connection between the sky, which forms an integral part of this world, and the land that they inhibit. A common problem is that the identification of an astronomic alignment does not necessarily mean that it has been significant for the society that produced it, and that it is their real function (Ghezzi and Ruggles 2008). All remains of human activity have an orientation, and there are innumerable potential astronomic objectives that cover almost all of the visible sky. Therefore, it is relatively simple, but often wrong, to discover astronomic alignments in tombs, horses, geoglyphs, temples, etc. With the absence of historical, or other type of evidence that corroborates the function of the alignment, to give a culture interpretation about them could be very problematic. This is especially true of the case of the alleged stellar alignments that, although were uncommon prehistorically, are very difficult to confirm because of the absence of historical evidence with which to corroborate (Ruggles 1990). In the first place, this is a great number of stars that can be observed from plain sight. They represent an extremely small part of the sky, which changes its position relative to the horizon steadily over the centuries. It is relatively easy to make an astronomic explanation “fit” whatever random orientation that is presented: It is enough to choose the stars and the appropriate dates. On the other hand, the date of construction of a prehistoric building is rarely determined with a greater precision than that of some centuries, a lapse during which the position of a star changed very much. Therefore, one cannot project with flippancy toward the past, when the technologies of observation were more simply, the astronomic alignments that are identified today thanks to the precision of modern instruments. In synthesis, it is very hard to verify stellar alignments through the contrary, the points of sunrise and sunset, the moon, and the planets are affected by a systemic change much smaller than that of the stars which is measured on a scale of thousands of years. So, the possible alignments of these celestial bodies are not affected significantly by the uncertainty as to the time when observations were made, since the position of sunrise and sunset with respect to the visible horizon is relatively stable over time. However, while the movements of the sun with respect to the horizon are relatively simple, those of the moon are complex, and those of the planets are the most complex of all. Given that the simplicity of these movements implies a smaller number of astronomic objectives to those that can orient a structure, solar alignment, and in smaller measurements the phases of the moon, it is these than can be established with greater trust apart from other archeological remains. Precisely, examples of the importance of the solar alignments around the world are abundant, especially among the indigenous villages of America (Ruggles 2005a). Perhaps the best-known modern example was registered among the North American Hopi (McCluskey 1977). An example of how problematic it can be to interpret assumed alignments out of its cultural context is the case of the famous geoglyphs in the pampas of Nasca. Thanks to the research of Maria Reiche, for decades it was considered that this was a huge astronomical calendar, in which the lines pointed to the stars and the figures represented constellations (Reiche 1993). However, subsequent research demonstrated that there are thousands of dispersed lines over an enormous area, and that these are virtually oriented in all directions of the horizon. Through statistical analysis of its orientations, it was demonstrated that the alleged astronomic alignments are not the factor that can explain the organization of the lines (Aveni 1990). This example illustrates the need to “cautiously” evaluate the “intentionality” of the supposed astronomic alignments. For this there are two methods: the statistical and the contextual (Ruggles 2000). The statistical argument is only applicable when a group of similar monuments exist similar to each other that are demonstrating alignment in consistent form. Excellent examples exist from the Neolithic Period in Western Europe, like the 177 registered antas in Portugal and Spain, that align themselves without exception with the sunrises (Hoskin 2001), or the 58 circles of rock in Scotland that consistently align with the moon on the summer solstice (Ruggles 1999). The contextual focus is more subjective, but it has advantages, as it identifies unique examples of deliberate astronomic orientations, such as Chankillo, and because it addresses questions about the motive and significance of these orientations. Thus, in the Neolithic passage in Newgrange, Ireland, it can be argued that the alignment of the sunrise on the winter solstice was intentional. Given that the principle purpose of the structure was for funerals, it can be affirmed also that the solstice alignment expressed by its designers a perceived connection between the solar cycles and the concept of death and ancestors (Ruggles 1999). Lego witnessing a sunrise in what would be one of the oldest astronomical observatories in the world, it is clear that the last inhabitants of Chankillo had a great knowledge of heaven, that we still have to discover. On the other hand, the solstial orientation of the Fortaleza de Sarmizegetusa in Romania had a more symbolic than practical purpose. A flat horizon is assumed, instead of a mountainous one like in reality, and it does not result from direct observations, although it does reflect the influence of geometric concepts in Hellenistic Greece. Therefore, it may not affirm to be a deliberate orientation (Ruggles 2005). Another common problem in the practice of archeoastronomy is the irregular use of the term observatory. This concept should be used with caution, as it immediately brings to mind an image with an evidently slanted view in favor of Western Science and the decline of the natives of ancient astronomers carrying out measurements with sophisticated instruments (Aveni 1993; Ruggles 2005a). Conceiving observatories only from the perspective of classic astronomy is an error just as grave as the error of wanting to attribute this specific function to any building containing significant alignments or involving in the design the possibility of making astronomic observations. In this sense, it has been mentioned before that the location, design, and orientation of the prehistoric monuments often reflect the dominant perception of how the world is structured. Its orientation, which is too often automatically interpreted as astronomic, is owed to many other reasons, among them the mythical place of a society’s origin, the foundational ritual of the building, the implicit needs of the design, topography, etc. If the orientation in effect is to an important astronomic event, ascertainably culturally, it could be interpreted as the symbolic association of this monument with a significant day of the year. This symbolic gesture is often perpetuated on the established rituals and practices of a society. But even in these cases in which the culture validity of astronomic alignments can be verified, it will not always be an observatory. This point is illustrated very well with the recent debates about the function and importance of the structures denominated Group E, in the Maya territory of Petén, Guatemala, one of the most significant complexes of monuments in the Americas related to the movements of the Sun. These fifty structures of Petén derive their name from a structure known as Group E, built around 200 to 300 AD in the Maya city Uaxactún, and it is famous for incorporating architectural alignments that can serve as points of reference of reasonable precise observatories of sunrises during solstices and equinoxes. Therefore, it is extremely recognized as a solar observatory (Aveni 2001). However, the rest of the structures of the Type Group E, that are relatively contemporary, very similar in form and are found in sites nearby, are generally not presented with the same alignments as Uaxactún (Aveni et al. 2003). 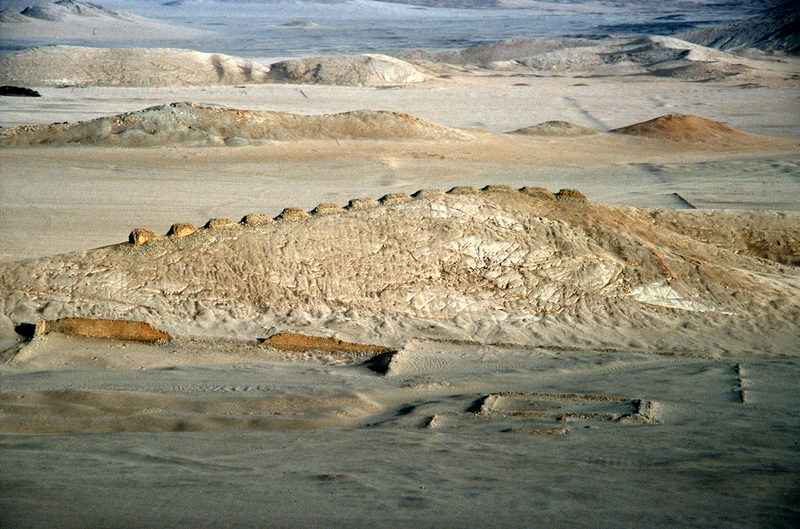 Additionally, the observatory of Uaxactún was modified at a subsequent date, so it was used less for rigorous observations (Aveni and Hartung 1989). One possible interpretation is that, while some of the structures from Group E incorporated affective solar alignments, others were nonfunctioning replicates (Aylesworth 2004) whose importance as far as calendric and ceremonial rituals did not need to be reinforced by actual observations of the sun. 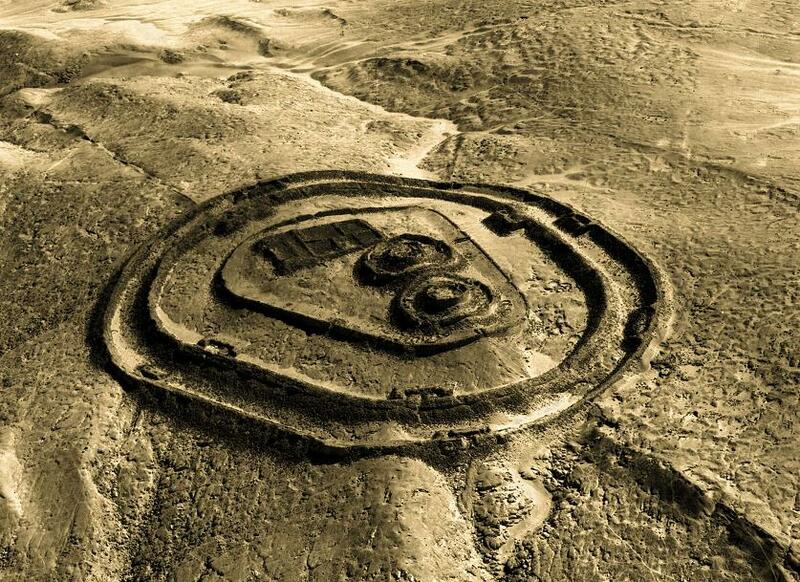 In fact, the term observatory seems to apply only to the initial purpose of a limited number of Mayan sites. Abounding examples of prehistoric sites exist in which solar and lunar alignments have been identified, which affirms the service of an ancient observatory. Unfortunately, in the majority of the cases evidence has demonstrated to be statistical but archeologically erroneous. This is the case of Stonehenge, England, where only the solstial alignment of the main axis of Phase 3 of the monument, which is repeated in various similar nearby and contemporary monuments, is established with complete security (Ruggles 1999, 2007). In the light of important lectures contained in these examples, the category of observatory should be reserved for a type of building used for astronomic observations – not as a symbol of expression, but empirically, directly to regulate the calendar by means of repeated observations over the length of time, as were the Trece Torres of Chankillo (Ghezzi & Ruggles 2008). The author is grateful to people and institutions that supported the archaeological research in Casma. First, appreciation goes to archaeologists and volunteers who participated in the Chankillo project since 2002. Special mention goes to José Luis Pino, for his preliminary measurements of astronomical alignments. Meanwhile, various institutions (Yale University, Pontificia Universidad Catolica del Peru, National Science Foundation, Wenner-Gren Foundation for Anthropological Research, Laboratory of Tree-Ring Research, University of Arizona, Field Museum, Schwerin Foundation, Earthwatch Institute, Cultural Association British Peru, Ancash Association and Global Heritage Fund) financed various aspects of archaeological research in Casma and Chankillo.